BACKGROUND: The identification of protective immune responses to P. falciparum infection is an important goal for the development of a vaccine for malaria. This requires the identification of susceptible and resistant individuals, so that their immune responses may be studied. Time-to-infection studies are one method for identifying putative susceptible individuals (infected early) versus resistant individuals (infected late). However, the timing of infection is dependent on random factors, such as whether the subject was bitten by an infected mosquito, as well as individual factors, such as their level of immunity. It is important to understand how much of the observed variation in infection is simply due to chance. METHODS: We analyse previously published data from a treatment-time-to-infection study of 201 individuals aged 0.5 to 78 years living in Western Kenya. We use a mathematical modelling approach to investigate the role of immunity versus random factors in determining time-to-infection in this cohort. We extend this analysis using a modelling approach to understand what factors might increase or decrease the utility of these studies for identifying susceptible and resistant individuals. RESULTS: We find that, under most circumstances, the observed distribution of time-to-infection is consistent with this simply being a random process. We find that age, method for detection of infection (PCR versus microscopy), and underlying force of infection are all factors in determining whether time-to-infection is a useful correlate of immunity. 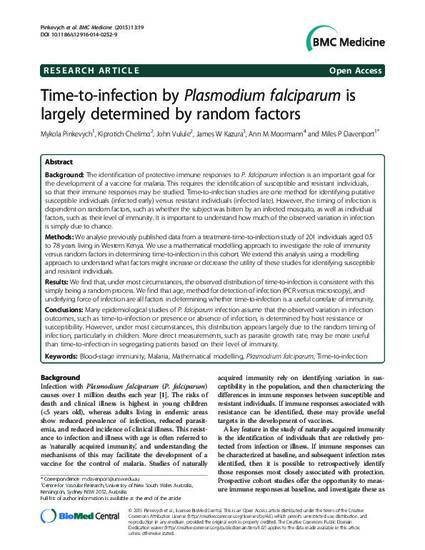 CONCLUSIONS: Many epidemiological studies of P. falciparum infection assume that the observed variation in infection outcomes, such as time-to-infection or presence or absence of infection, is determined by host resistance or susceptibility. However, under most circumstances, this distribution appears largely due to the random timing of infection, particularly in children. More direct measurements, such as parasite growth rate, may be more useful than time-to-infection in segregating patients based on their level of immunity. © 2015 Pinkevych et al. ; licensee BioMed Central. This is an Open Access article distributed under the terms of the Creative Commons Attribution License (http://creativecommons.org/licenses/by/4.0), which permits unrestricted use, distribution, and reproduction in any medium, provided the original work is properly credited. The Creative Commons Public Domain Dedication waiver (http://creativecommons.org/publicdomain/zero/1.0/) applies to the data made available in this article, unless otherwise stated.